Published 2000 by Skipjack Press, 6 Laport Court - Ocean Pines, Berlin, MD 21811. 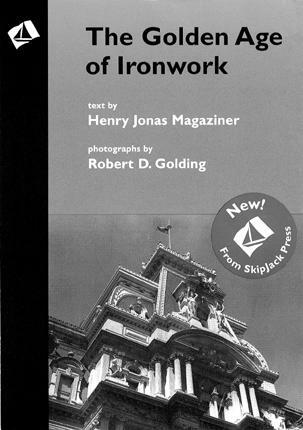 I have been fortunate enough to get my hands on a pre-publication copy of the latest book from Skipjack Press, and, as usual, publisher Jack Andrews has made a significant contribution to the world of architectural ironwork with the publication of this book. It examines ironwork from a unique perspective. It's about a specific place: Philadelphia, Pennsylvania, and a specific time - roughly 1840 to 1930. However, it is not about a specific technique. There is a lot about cast iron in this book as well as forged iron. It's more about the context in which architect-ural iron was used, both cast and wrought, and how examples of the iron worked with the houses and buildings where it was placed. Before reading this book, I looked down on cast iron as a poor substitute for blacksmithing. In today's world, that opinion may be debatable, but after reading this book, I've changed my views. I will never look at cast iron the same way again. The examples of early iron casting shown in this book are works of art in the truest sense. Throughout the book are examples of how the ironwork enhances and supports the architecture, both cast iron and wrought iron, and why the iron works. For example, the author examines the symbolism found in a cemetery gate detail, complete with cast weeping willow tree, doves, and lambs, and explains that it was used as a typical Victorian image for the grief of family members. The information about casting is most interesting; at the same time, there is no shortage of wrought iron examples here. Many photographs of Yellin's work in Philadelphia are included which is logical, since Philadelphia was the home of Yellin's Art Street studio for so many years. There are many examples of railings and gates by other unknown blacksmiths as well, all in high-quality images by photographer Robert Golding. The 168 photographs are logically catalogued in the back of the book. There is also a glossary; the book's research is documented with references, a bibliography is given, and it is indexed. These details help the book serve as a valuable research tool. I can strongly recommend this book; the approach is unique, the commentary informed, and the examples are beautiful. It would make a wonderful Christmas present for someone whose interests lie in the field of ironwork.